Human comprehension of story isn’t all cognitive. That’s the lesson taught to us by how humanity constructs myth. There are certain narrative constructions we all understand and they are there for a reason, because they work by speaking to who we are as human beings and what we need from our stories. 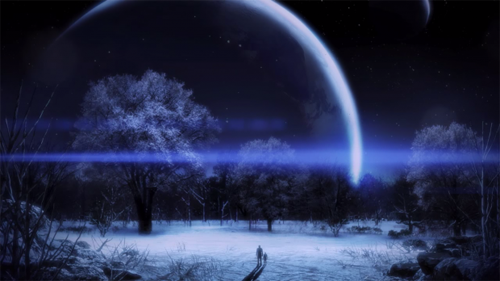 BioWare has curb-stomped those psychological narrative underpinnings with the end of Mass Effect 3. It’s no wonder pundits have lumped everyone upset about the ending into the same bucket as the extreme haters who are demanding a new ending out of BioWare. Anyone who is really upset about the ending, but doesn’t understand or cannot elucidate why, probably does sound like a raving lunatic to someone else who doesn’t get it or doesn’t care. 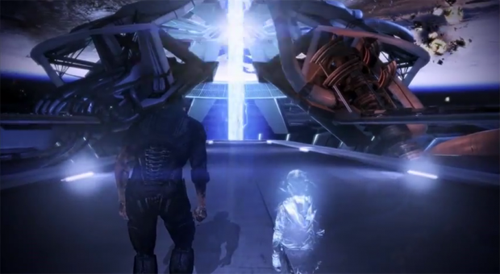 When someone says “I demand a new ending to Mass Effect 3!” what they really mean is “This ending has disappointed me deeply,” and that could feed constructively into a discussion of what happened to make them feel that way, which is a discussion about narrative construction. It bothers me that discussion hasn’t taken place yet within the pages of the outlets which are meant to hold the authoritative, critical voices about video games. It bothers me even more that it may never take place within the pages of those outlets. 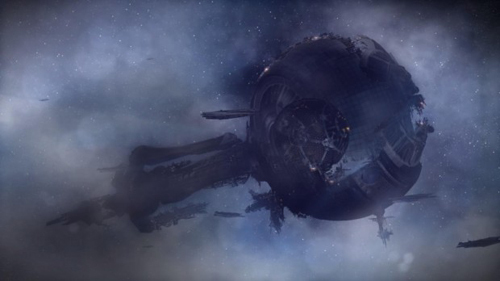 Mass Effect 3 is a watershed moment in many ways. One of them is demonstrating the limitations of our traditional methods for talking about video games. Shamus Young provides a wide-ranging deconstruction of the three endings. I disagree on some of his points, but his feedback regarding the Reapers and why the Normandy is running away are poignant if you want to skim. Doyce Alan Testerman brilliantly uses The Lord of the Rings as a metaphor to explain to non-Mass Effect players what the controversy is all about. This video borrows the Red Letter Media treatment of The Phantom Menace to discuss the narrative incoherence of Mass Effect 3’s ending in the context of the entire series. The endings may not respect character choices, they may ultimately be the same ending with slightly-but-not-very different cut scenes, but those aren’t the issues that concern me. The endings don’t make sense. They are indefensibly full of holes. The end is such a palpable, tonal shift from everything else in the game that it smells awfully like a first draft, especially with the unpolished dialogue that has no rhythm whatsoever. I was a screenwriter in my early 20’s. It never went anywhere but what I got out of the education and experience was a familiarity with how stories are told on film and in television. That’s what I bring to the table as a critic when I write about Mass Effect 3. It doesn’t make me an expert, but it does mean I glean on to the sorts of narrative issues Mass Effect 3 presents whether I’m looking for them or not because I see movies in a different way, and Mass Effect 3 is definitively a movie. It’s a movie with a video game attached. To a point I understand why the video game press has more often mocked the fans who have issues with these endings than tried to understand why anyone has the issues in the first place. The underlying expertise of a video game journalist concerns video games, not storytelling. The average game journo might not have any interest in investigating what’s wrong with Mass Effect 3′s ending because who cares, it’s just the story, right? Shamus Young throws another post into the ring worth reading on this specific topic, the idea that game reviewers care about mechanics first and everything else second. Unfortunately, mechanics are the least important part of the equation here, and so traditional reviewers aren’t well-equipped to lead these discussions. If we’re going to increasingly see video games that lean heavily on their cinematic narratives such that traditional reviews don’t cut it anymore, we’re going to need more video game reviewers conversant in discussing film, or at the very least close analysis of some kind. Lack of expert voices is half the challenge of having real discussions about the narrative issues with Mass Effect 3’s endings in the games press. The other half is that it’s very easy to derail that discussion into one of a few related but entirely different discussions altogether which the games press is equipped to handle right now. Some people have avoided this problem by remaining tethered to an emotional connection to their Commander Shepard, regardless of what was taking place in the story around their character. Kate Cox’s column on Kotaku and my wife’s blog post on Two Whole Cakes speak to this perspective. Neither Kate nor my wife spend one moment in their pieces actually delving into the narrative construction of the game’s ending. Kate and Lesley are entirely wrapped up in their emotional experiences of playing Commander Shepard, and the life lessons spoken to them by that emotional experience. For some people the emotional reactions to the ending supersede any cognizance of the issues around narrative construction. These people simply do not care if the ending doesn’t make sense. My emotional reaction was venomous bile at how badly BioWare fucked up the ending structurally, which explains why I’m not interested in this emotionally-based conversation at all. I have nothing constructive to bring to the table. How I feel is certainly easier to discuss than the underpinnings of why I might feel that way. The question of whether a piece of art belongs to its creator, or whether once that art is released onto the world it belongs to the world, is the basic framework of the fracas around George Lucas dicking around with the original Star Wars movies after the fact. Now the same discussion is taking place around whether or not BioWare fans have a “right” to demand a new ending, and/or whether or not BioWare should do so, and whether or not it is dangerous for the video game form if BioWare acquiesces. Kotaku Editor-in-Chief Stephen Totilo argues that video games are a malleable art form, such that changing the ending does not necessarily clash with artistic integrity, and Leigh Alexander discusses the sense of ownership that BioWare gave to Mass Effect fans and how that plays into the debate. These are not conversations about the ending of Mass Effect 3, not that they purport to be. Totilo and Alexander don’t begin with a conversation about the ending’s merits, or lack of, and then slide into the ownership debate, but you will see plenty of people derailing into this territory. Again, this is more comfortable ground for the average video game journalist or pundit than close analysis. I’ve also seen conversation about Mass Effect 3’s ending go into “At least BioWare took a chance on the ending” conversations, which are ultimately about whether or not the video game industry takes enough risks. Also a conversation that has nothing to do with an analysis of Mass Effect 3’s ending, but rather one which address a larger question independent of this one game. Inasmuch as the video game press is the solitary curator of video game criticism at the moment, and inasmuch as criticism is a major component in the development of any art form, it’s important that conversations like the narrative construction of Mass Effect 3’s ending be had within the games press for the authority and reach those conversations carry with them. If another, blockbuster title had been released on March 20th, two weeks after Mass Effect 3 hit shelves, I doubt anyone would still be having any conversations about Mass Effect 3 on major outlets. The video game journalism audience has been raised on a steady diet of “Newer! Bigger! Better!” There’s a tight statue of limitations on discussion of any one title in video game journalism. Now would be a good time to make sure we have voices ready to provide close analysis quickly in order to make those windows, as Mass Effect 3 is the harbinger of future games whose balance of comprehension lies more heavily in the narrative than the mechanical. Dennis, March 31, 2012. 1 Comment on The Many Ways We’re Not Discussing Mass Effect 3. Category: Posts. Huh. So I stumbled upon this blog after reading your Datura review on Ars today and I’m surprised nobody’s commented after all this time. Thank you for this article. I feel the same way about the game’s ending and the discussion around it and this article put it into words far better than I’ve been able to.